This Philips lamp is used in fluorescent fixtures that have high frequency electronic ballasts and 2GX13 sockets. 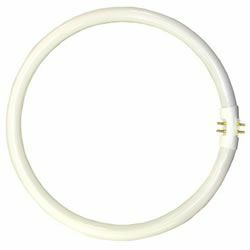 Note that this 22 watt T5 circular lamp has a unique 4-pin configuration, in which there are two pins on either side of the glass tube. NOTE: Replacement bulbs are designed for specific fluorescent fixtures and are generally not interchangeable. We cannot cover the return freight for misordered bulbs. Please verify wattage, base style, and manufacturer before ordering.